Lake Retba natural pink lake in Senegal East Africa is at its height of rosy pinkness during the dry season between November and June. Not many living organisms are able to survive in Senegal's pink Lake Retba because of its high salt content. In Africa, there is a natural lake the color of strawberries, Lake Retba or Le Lac Rose lies in Senegal one hour from its capital city Dakar. The lake is named for its pink waters caused by an edible, salt-loving micro-algae dunaliella salina. Lake Retba or Lac Rose as it is known by locals is separated only by some narrow dunes from the Atlantic Ocean and, as expected its salt content is very high. Its salinity content compares to that of the Dead Sea and during the dry season it exceeds it. The lake is only 3 square kilometers big (about 1,1 square miles) and there is no major town developed along its shores. 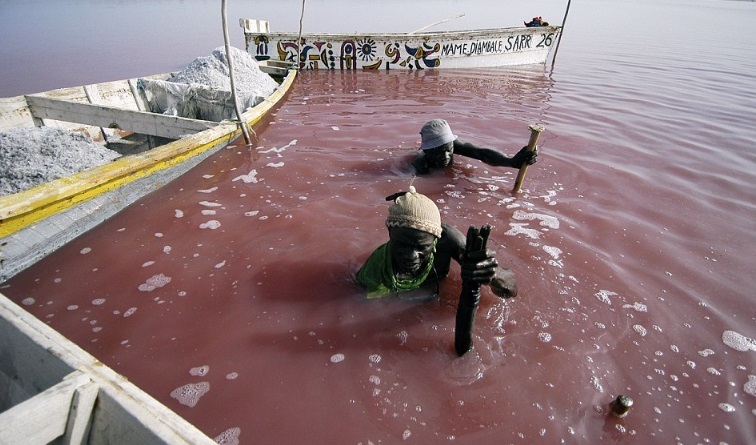 The natural strawberry pink lake of East Africa’s Senegal is a world famous tourist attraction. However Lake Retba pink waters is a source of income for African families who mine her salt. 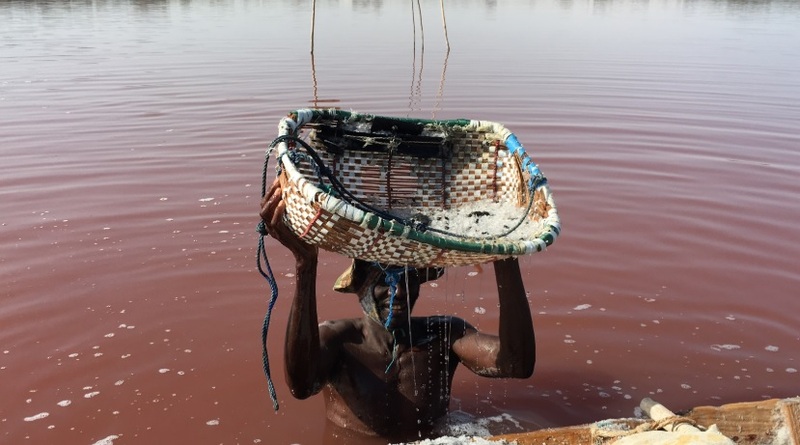 Salt miners who work on extracting salt from the lake use shea butter obtained from the shea nut tree to protect their skin from cracking and drying. The Dunaliella salina bacteria which gives the lake its distinct color is completely harmless to humans and swimming in the lake is possible. It is estimated 1,000 people work around Le Lac Rose collecting 24,000 tons of the salt each year. Over half of the salt from Lake Retba is exported throughout Africa. With a maximum depth of less than ¼ mile, it contains a significant amount of salt that is labored by salt miners and exported throughout the world for cooking, leather goods and deicing roads. Lake Retba or Le Lac Rose lake was the finish line of the well-known Dakar Rally before it moved to South America in 2008 due to security threats.